This past week I got to spend more time with the lively and intelligent 1-3 graders at Seward Montessori. Kristi taught students all about Minnesota fruits and vegetables that people were able to enjoy throughout the winter months when refrigeration wasn’t yet an option. Kristi explained that many people had root cellars to keep things like root vegetables, squash, and alliums fresh and that some produce – such as kale and other cole crops – could be harvested during colder months. Imagine the surprise on some students’ faces when they heard that “back in the day,” the only fruit children were able to eat during the winter were apples! They were in disbelief! 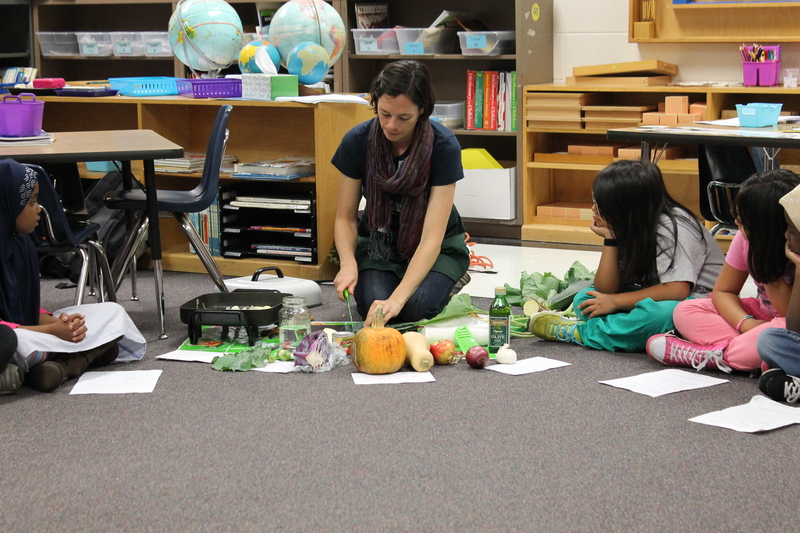 After harvesting a rutabaga, students were led back inside the classroom to watch Kristi put together a vibrant winter vegetable stew. Leeks, dinosaur kale, and rutabaga (fresh from the garden!) were all included in the stew. It was fun to see how eager the children were to try it. Many of them commented on how good it smelled and when they tried it, exclaimed that it tasted great too!